In order to be a great skater you need good balance. New hockey players are usually off balance, bow-legged, stutter stepping and some look like they just finished riding a horse for 6 hours. Why do new hockey players look so out of place on the ice? Because they don’t have good edge control. Learning how to control your edges will help you a lot with balance, control, and a smoother stride. 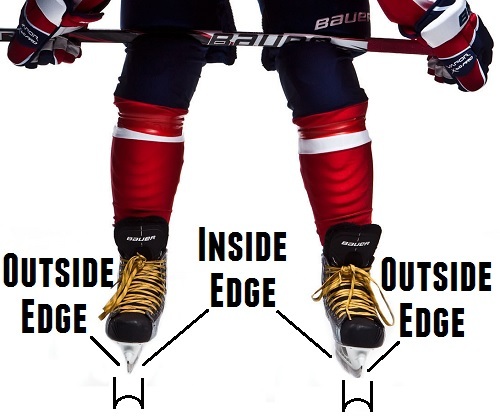 Edge drills will help players from beginner right up to pro players continue to improve and feel comfortable in their skates. 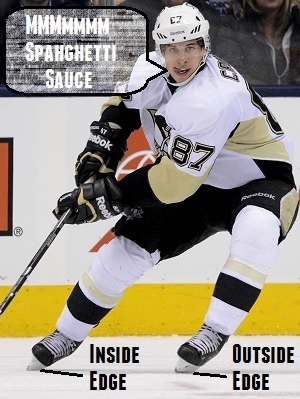 In fact in one of the videos below Sidney Crosby begins his practice with edge drills. If you are a true beginner you may want to practice some balance drills (the next video I will be uploading) but don’t be afraid to try out these edge work drills as well. The only way you will get better is if you keep challenging yourself. If you are an experienced player these drills can also challenge you. By using this progression you can continue to use the same drills, and the same routine and continue to improve as a player. Each skate has two edges, an inside edge and an outside edge. See the picture below for a better idea. When you are accelerating you want to use your inside edges. You will be leaning slightly forward, with your feet turned and your skates on an angle to the ice. You want to really dig your blades in with each stride, bite those edges into the ice and go! When you are turning you will be using an inside edge, and an outside edge (depending on which way you turn). If you are new you might not trust your edges and keep a very wide stance while turning. You need to trust your edges and let them grip into the ice while you make sharp turns. When you are stopping you are also using one inside edge and one outside edge, you achieve this by bending your knees, getting lower and having your skates at an angle. In this case you don’t want your weight right over your feet though as that will cause your edges to dig in, you want to “slide” a bit on your edges. When you are gliding you are not really using either edge. They will both be in contact with the ice, but you will be gliding on the hollow between the edges. If you are gliding with a wide stance it can slow you down because your inside edges will be digging too much into the ice. In the videos below you can see Crosby using the inside edge drill that I describe in the video above. Here is another video of Crosby using the mohawk drill that I show in my video on how to do the Mohawk turn. This drill uses the inside edges. Crosby is pretty good so he uses a puck at the same time. Why should you work on your edges? In my opinion edge work drills are the best way for hockey players to push their limits and become more comfortable in their skates. A good hockey player will feel just as comfortable in their hockey skates as they do with running shoes on. We have a full series on skating called the fundamentals of skating. Visit this link if you want to learn to skate, or become a better skater. If you found this article helpful feel free to share with your team, league, or on Facebook or Twitter with the tools below. Great piece. Very helpful. Edge control cannot be underestimated even for a pro. I’ve only recently noticed in high-level hockey players, the form of stopping/turning you mention at 1:20 of this video, the one-foot stomp. I’ve tried teaching myself this move, with very limited success (normally the blade jams and I trip up). I’d love for you, or anyone for that matter, to do a video on this advanced technique.